UNITED NATIONS, Jul 2 2012 (IPS) - Talks to develop greater control of the arms trade have cast a glaring spotlight on the role of diverse countries in fuelling conflicts worldwide, offering governments a historic opportunity to rein in the flow of weapons. After six years of negotiations, 190 governments have embarked on conclusive month-long talks beginning Monday, which could end in a legally binding Arms Trade Treaty to oversee the arms trade. China, France, Russia, the US and the U.K. account for 88 percent of the global arms market, where small arms and ammunition alone were valued at 411 billion dollars in 2010. Currently, legally binding international standards for the arms trade are non-existent in a patchwork system with many loopholes. About half of all countries lack even basic laws on the export of small arms. “Without an arms trade treaty, unscrupulous brokers and manufacturers can take advantage of the countries with the weakest regulatory systems. The country with the weakest laws effectively sets the standard for the rest of us.” Natalie Goldring, a senior fellow with the Security Studies Programme at Georgetown University, told IPS. Weak laws give free rein to unscrupulous brokers such as Russian military officer Viktor Bout, currently awaiting trial in the US. Nicknamed the “merchant of death,” Bout’s deals with warlords and human rights violators crisscrossed the African continent, the Middle East and south-central Asia, according to U.N. reports. Globally, the United States represents a gold standard in terms of diligence in export controls, including the monitoring of exports, licensing, and reporting on exports. Natalie Goldring, a senior fellow with the Security Studies Program at Georgetown University and representative of the Acronym Institute at the United Nations on various conventional weapons and arms trade issues, spoke to IPS about challenges and misconceptions surrounding the development of a strong treaty. One concern is that sceptics of the treaty may try to use the U.S. demand for consensus decision-making as a way to weaken the treaty. If consensus is defined as unanimity, then each country in effect has the ability to veto a possible treaty. That puts the treaty at the mercy of the least supportive country in the room. If the treaty language stresses the economics of the arms trade rather than humanitarian and human rights concerns, that will be an important sign of a weak treaty. Weak treaty language could also undermine existing instruments, such as the Programme of Action to Prevent, Combat, and Eradicate the Illicit Trade in Small Arms and Light Weapons in All its Aspects. In addition, arguments put forward by the National Rifle Association (NRA), that the Arms Trade Treaty will affect U.S. Second Amendment rights (specifically the constitutional rights of law-abiding American gun owners) may be effective for NRA fundraising, but they’re irrelevant to the treaty. The NRA seems to be trying to raise public fears about a prospective treaty. The U.N has published an official document to counter disinformation about the treaty and subsequent misunderstanding about its content and effect. The Arms Trade Treaty will only affect international transfers of weapons. It will not affect what happens within signatory countries. For Goldring, a robust treaty will set clear criteria for denying arms transfers. The scope of the treaty must be comprehensive, including all conventional weapons, ammunition, parts and components, and all kinds of transactions. Implementation will require countries to report regularly on their transfers and their denials. A weak Arms Trade Treaty would be worse than no treaty at all, says Goldring. If the member states are unable to reach agreement on a robust treaty in July, they should end this round of negotiations and seek alternatives. However, iwatch News by the Centre for Public Integrity, a non-profit investigative news organisation, has documented numerous instances of countries receiving large U.S. arms packages and simultaneously struggling with human rights problems, including United Arab Emirates, Qatar, Israel, Djibouti, Honduras, Saudi Arabia, Kuwait, and Bahrain. According to the State Department’s Military Assistance Report, U.S. firearms, armoured vehicles, and items from a category that includes chemical and riot control agents like tear gas were provided to Algeria and Egypt, where the repression of democratic dissent over the past year has been manifest. When it comes to the issue of determining whether the weapon in question is likely to fuel human rights abuses, “The U.S. is not the global leader,” Scott Stedjan, senior policy advisor for humanitarian response, Oxfam America, told IPS. The Control Arms Coalition, which includes Oxfam, the Arms Control Association, and Amnesty International, has voiced concerns that this approach will factor into negotiations as one of the U.S. proposals for the treaty. The Control Arms Coalition has developed criteria for an Arms Trade Treaty, including the refusal to supply arms when there is a substantial risk that they will be used to violate international human rights or humanitarian law. The latter is titled “the golden rule”, crucial to the development of a strong treaty, according to the group. 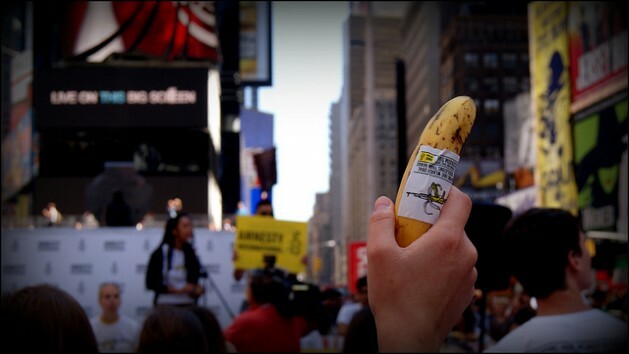 Amplifying the coalition’s position, Amnesty campaigners held a banana-themed demonstration titled “Bananafesto” in Times Square Jun. 27, to raise awareness of a weapons trade less regulated than the exchange of bananas. Activists also posed in body bags outside the U.N. Monday, to mark the start of negotiations. Keira Knightley, Kevin Spacey and British war photographer Paul Conroy, among others, have also shown their support in a letter sent to U.N. Secretary General Ban Ki-moon, which presses the need for a strong treaty. But how arms exporters are to determine when there is a substantial risk that a weapon will be used to commit a serious violation of international human rights presents a challenge for negotiators. You cannot deny arms to countries that have a few isolated incidents of unlawful gun-crime, according to Wood. Asked what constitutes a ‘serious violation’ Wood told IPS, “It could be a single massive massacre so you can’t say that violations have to be persistent… you can also look at the severity of the harm caused, as well as the persistence and the scale. Is it widespread? If (the problems) are persistent, then they are predictable,” Wood explained. In terms of measuring the risk of human rights abuse, a key issue is stockpile security. “When exporting arms to the DRC and to Afghanistan where the state itself has partly collapsed, the stockpiles are not properly managed so you know as soon as you send weapons they will leak out to armed groups and the Taliban,” Wood told IPS. In many ways the treaty is not merely about regulation but also about educating governments and developing expertise within arms export divisions so that they understand and can identify areas where weapons are likely to feed human rights abuses or end up in the wrong hands. Elephant in the room: Absolutely no regulation of arms in USA–a six year old girl and other innocent civilians shot dead watching a movie, ?????????? Where’s the coverage of USA’s gun holocaust???????????? ?